It was a scant two weeks ago that Marian and I attended the Palmer Vineyards Wine Club Summer Get-together. Time flies in the summer… it is hard to believe that two weeks have passed since we put ourselves in the hands of Miguel Martin, Palmer’s winemaker, and his capable crew. In the dead of winter, we visited with Miguel and received the grand winemaker’s tour of Palmer. You can read about it here. 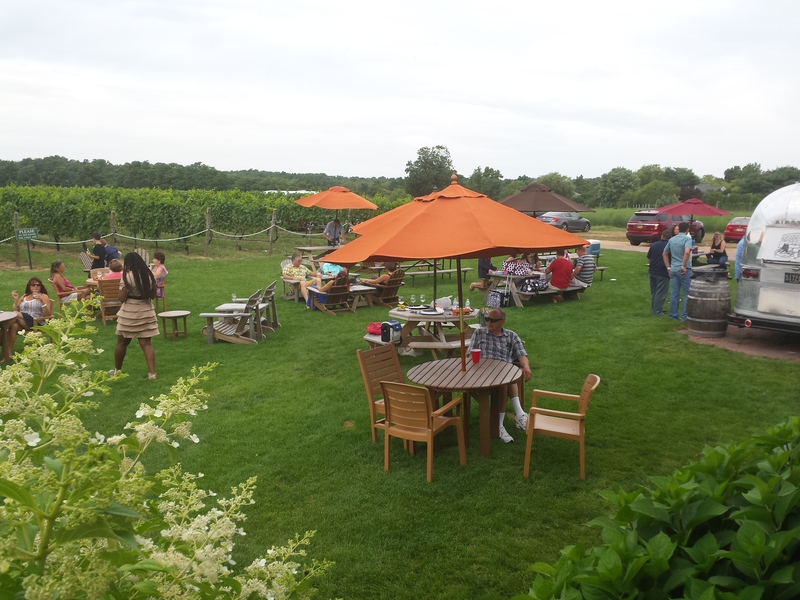 Palmer Vineyards is located on Sound Avenue, just east of Riverhead, NY. The grounds are beautiful and spacious. If you head out to Palmer from points west on a Saturday or Sunday, you may arrive and think the parking area is full. Don’t drive by! There is plenty of room for your car, and for you and your party to picnic and enjoy. Every weekend there is a party scene going on at Palmer. This particular weekend was special, as the Palmer team celebrated the Palmer wine club members. We met folks from all over the metro area. I was surprised to learn how many club members thought nothing of driving out from Queens or Brooklyn to enjoy the wine and conviviality. Here are some shots of the wine club’s special area. Note that the tent was welcome as the sun traded places with rain clouds more than once during the afternoon. Marian and I enjoyed some crisp Pinot Blanc, along with the picnic food (chips, veggies, fried chicken, and Noah’s) and the conversation of fellow club members. In the club? You were treated to two glasses of wine gratis, heavily discounted re-fills afterwards, and participation in a drawing for a variety of worthwhile prizes. Noah’s Restaurant in Greenport has partnered with Palmer’s, serving light bites at the vineyard, on weekends. They provided the main course for this party, sending their iconic Airstream trailer to the Palmer’s picnic area. Here you can see Noah’s crew in action. On offer were Kobe beef sliders, pork belly sandwiches, and lobster rolls. Hey it is summer and we did the lobster rolls. Delicious, and perfectly complemented by the Pinot Blanc. Noah’s had all sorts of sides, but we kept it simple. When you see the airstream, don’t hesitate. Noah’s food is great! Palmer winemaker Miguel Martin was everywhere during the get-together, but he found a few minutes to spend with us. Aside from telling us about the great reception his Albariño is receiving, we learned that there will be a Fall 2014 wine club party that should be amazing. Hey, you have time to join the club and meet your newest buddies, right here at Palmer. Why wait? Next time you can be in the picture. Until then, enjoy your trip around town!